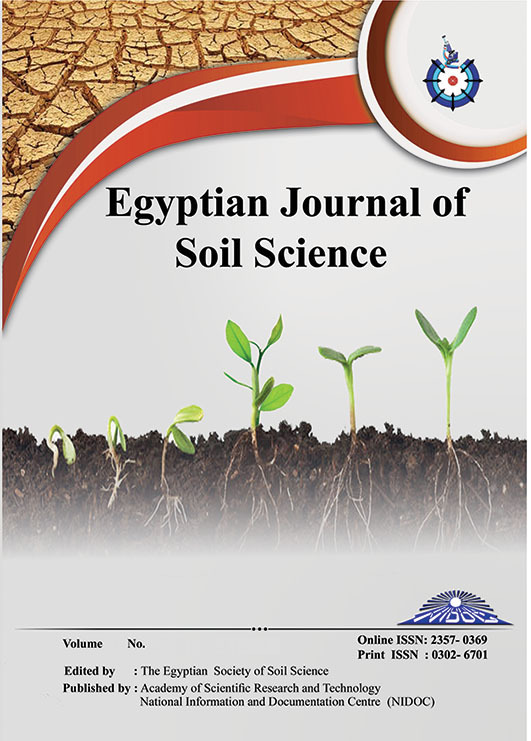 This experiment was performed during the summer seasons 2015 - 2016, at a private farm in the El Kasasin area, Ismailia governorate, Egypt, to study the effect of deficit irrigation (DI) during growth stages compared to full irrigation (FI) under surface drip (SDI) and sub- surface drip (SSDI) on marketable yield (Ym), plant quality parameters, water use efficacy (WUE) and irrigation water use efficiency (IWUE) of carrot (Daucus carota L.) crop. The experimental design was a split plot design with three replicates. The obtained results indicated that, the values of quality parameters, Ym, ETa for carrot roots decreased with increasing DI during the growth stages especially (initial and development stages) except L-ascorbic acid content and total sugar content which increased with increasing DI under SDI and SSDI for both seasons. In addition; the maximum values of Ym for carrot roots were 8.38 and 8.56 Mg fed-1 , respectively, under the FI (I=100, D=100, M=100, L=100%) and SSDI treatment. While, the minimum values of ETa were 154.00 and 157.79 mm , respectively, under the DI (I=60, D=60, M=60, L=100%) and SSDI treatment. Moreover, the values of WUE and IWUE under the DI (I=80, D=80, M=60, L=100%) and SSDI treatment for both seasons increased significantly to reach; 50 and 28 % compared with the control treatment (FI and SDI). Finally, the DI (I=80, D=80, M=60, L=100%) and SSDI treatments save approxymately 34% of the applied irrigation water although the reduction of Ym was approxymately 4% compared with the control treatment (FI and SDI). Deficit irrigation (DI) strategy has been chosen for use in the study as it maximizes irrigation water productivity and optimizes crop yields.